The Razer Thresher Ultimate is a lag-free wireless gaming headset with great sound and fantastic battery life for your Xbox One console. While the gaming headphone market is crowded, it can be difficult to find a decent pair of great sound wireless headphones. This holds especially true for consoles like the Xbox One that don’t natively support wireless connections for headphones. 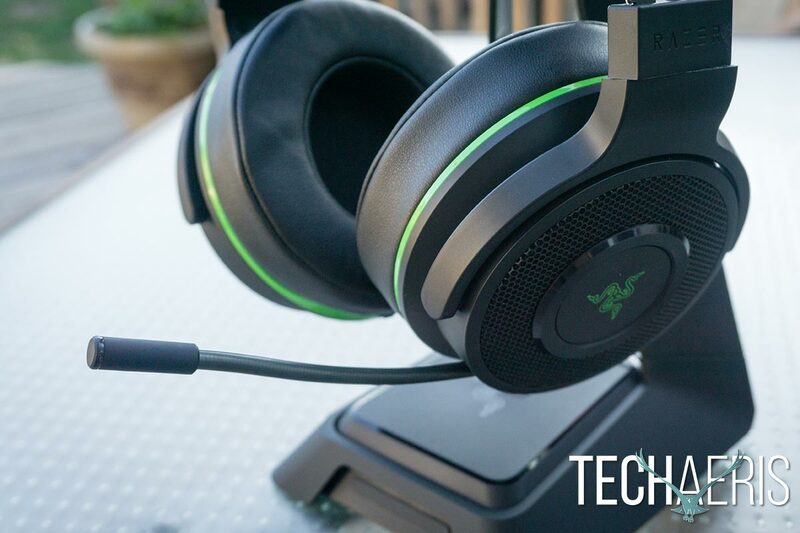 Our Razer Thresher Ultimate review takes a look at a wireless headset for the Xbox One which brings wireless sound to your console (and PC/Mac) through USB and optical audio. The headphones themselves look like your typical high-quality gaming headphones these days. The headband is of the two layer variety with an adjustable padded headband on the bottom and a two band metal headband above that. The padded portion has a mesh material on the underside and a nice leatherette material on the sides and top with the Razer name engraved across the top. 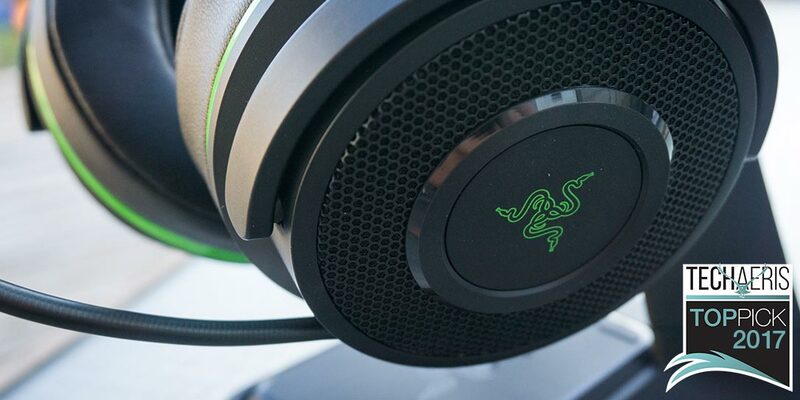 The Razer Thresher Ultimate headband. While they are adjustable, they are more self-adjusting as you can’t set the height of the headband. Instead, when they are placed on your head, two thin wires on either side pull out slightly to adjust to create a comfortable fit. Each side of the headband ends in a plastic piece with the Razer name engraved in each piece. On the inside of these pieces is an L or R to indicate which ear they go on. Attached to these pieces are the inverted U style earcup holders, also made from sturdy black plastic. The holders rotate slightly forward and a full 90º back. The over-ear earcups themselves feature a black plastic outer shell with mesh surrounding the Razer logo on the outside. The Razer logo lights up in green when the headset is turned on. The retractable microphone is located in this portion on the left earcup. When the microphone is being muted, the end of the microphone has a red LED ring which lights up. 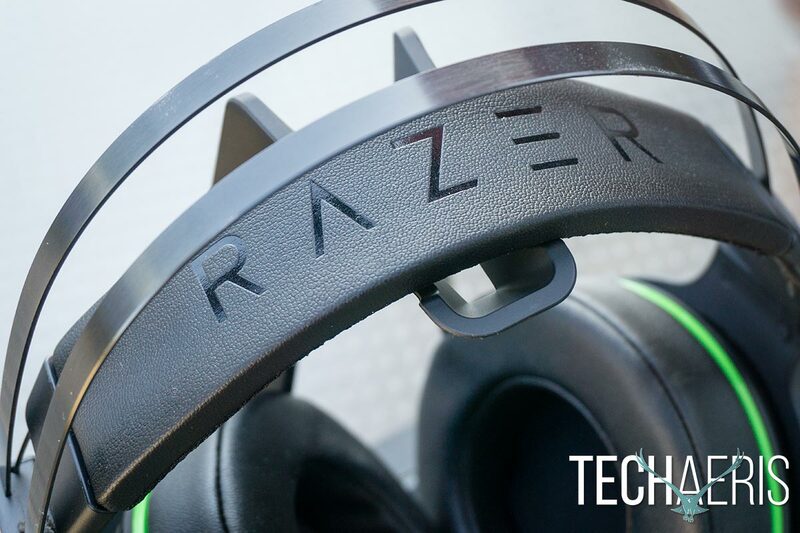 The outer shell of the Razer Thresher Ultimate headphones. 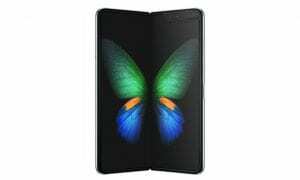 Between the outer shell and the leatherette ear cushions is a thin green piece which flares out more towards the bottom, housing the controls and ports on both sides. The left hand earcup is where you’ll find the power indication LED, power button, Micro-USB charging port, and the game/chat volume/microphone mute dial. The right earcup is where the master volume/mute dial is located. Most of the controls and ports on on the left earcup. A similar dial is on the right earcup for master volume control. The leatherette cushions are soft and comfortable. Each cushion is about an inch thick and four inches in diameter with the audio cutout being about two inches thick. If one looks closely, there is a very slight dimple visible which helps to accommodate those who wear glasses. The cushions are snapped into place with three nubs that snap into the outer shell. For those wishing to register their headset, the serial number is located under the left ear cushion. The leatherette ear cushions are soft and comfortable. While not on the smaller scale as far as headphones are concerned, they are fairly lightweight and very comfortable, even for extended gaming sessions. 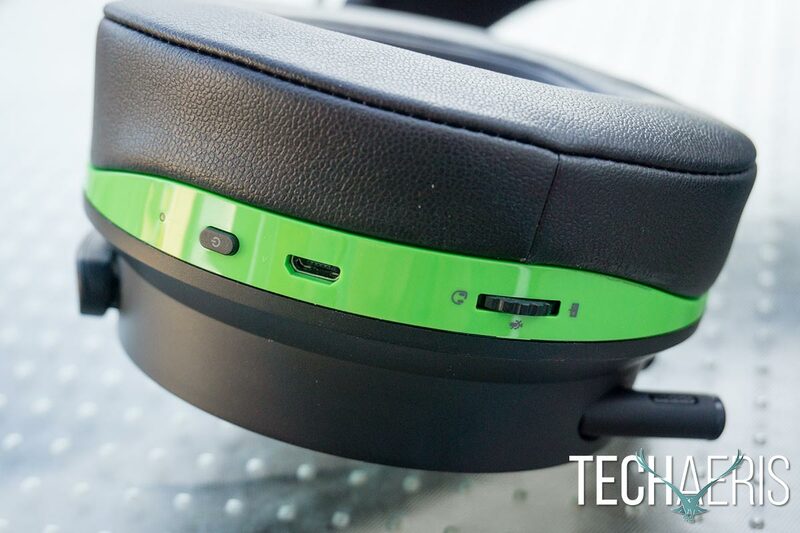 The audio hub is essentially the brains that power the headset and allow you to use it wirelessly with the Xbox One console. 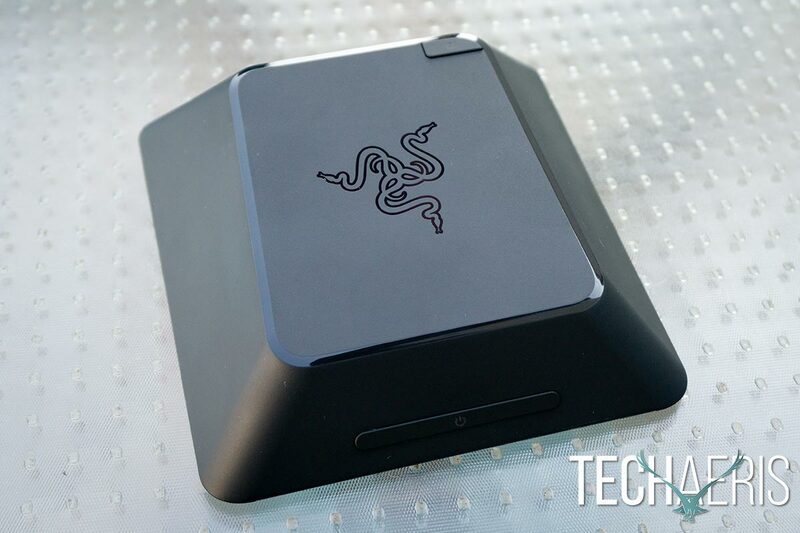 The audio hub is a square black box roughly 4 1/2″ across, slanting slightly up towards the back and has the Razer logo engraved in the middle of it. The headphones are connected to the Xbox One (or PC/Mac) via the audio hub. The front of the hub has a long narrow power button, while a smaller Dolby toggle button sits in the upper right-hand corner on the top face of the hub. The back of the hub is where the optical audio out, optical audio in, Xbox/PC switch, Micro-USB, and USB-A ports are located. The bottom of the hub is covered in a nice rubbery surface to prevent sliding. The ports on the back of the audio hub. The included Micro-USB to USB-A cables are braided, while the included optical audio cable is a little on the thin side and would be nicer if the cable wrap around it was a tad thicker. There really isn’t much to the stand itself. It’s constructed of relatively — but sturdy — black plastic and comes in two pieces. When assembling, it took a bit of finicky fitting to get the two main frame pieces for the stand together but once they were together, it’s a solid stand. The headphones simply sit on the top of the stand by the headband. The nice thing about the stand is that you can set it up anywhere you need to or it clips into place right on top of the audio hub. The base of the stand is designed with cutouts so you can access the necessary buttons and ports, as well as still see the top of the audio hub when it is sitting on top of it. I actually prefer this setup as the headphones are then in close proximity to the hub for recharging. The stand can optionally sit over the audio hub. 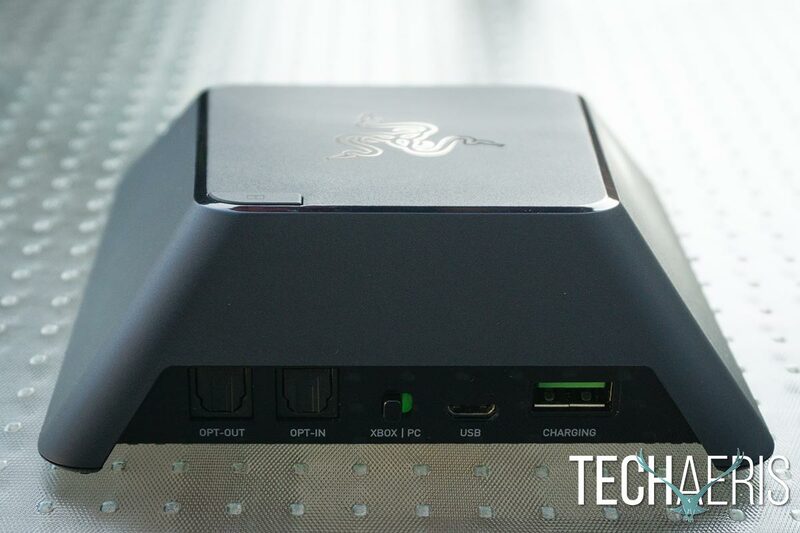 At first glance, the setup can look pretty daunting with the multiple ports on the back of the audio hub. In both the case of the Xbox One and the PC, it’s fairly straightforward. 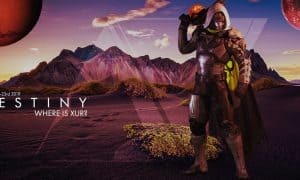 If you’re currently using optical audio out on your Xbox One to your home entertainment receiver, you’ll have to disconnect that from your Xbox One first. Next, set the Xbox/PC toggle on the audio hub to Xbox. Connect the audio hub Micro-USB port to a free Xbox One USB port then plug the optical audio cable from your Xbox One to the OPT-IN port on the audio hub. Finally, if applicable, plug the optical audio cable that used to be in your Xbox One to the OPT-OUT port on the audio hub to your receiver. Once you’ve connected the necessary cables, turn on your Xbox One then go to All Settings > Display & Sound > Audio Output and select Optical audio > Bitstream out. Finally, set your Bitstream format to Dolby Digital and you’re good to go! 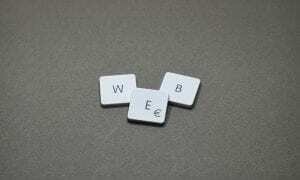 Connecting to a PC or Mac computer is much simpler. Set the Xbox/PC toggle to PC, connect the Micro-USB port on the audio hub to a free USB-A port on your PC or Mac, then select the Razer Thresher Ultimate for Xbox One in your respective audio settings and you’re all set. 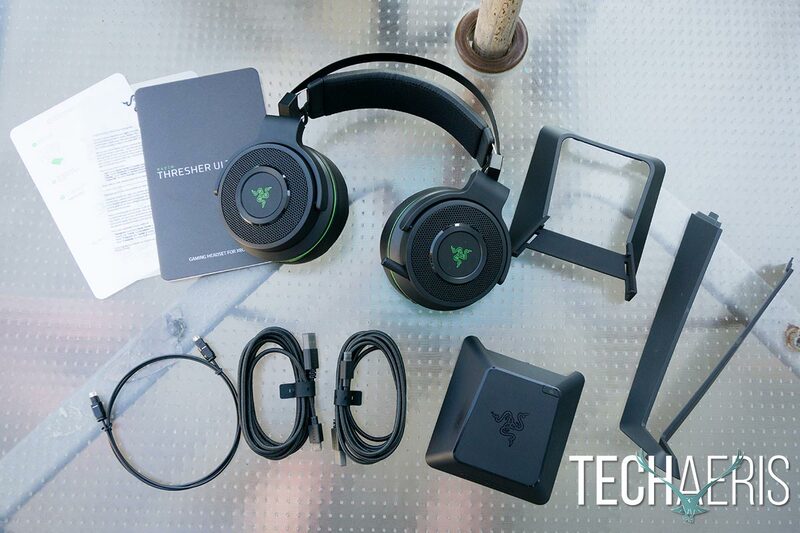 If you’ve used wireless headsets or gaming headsets before, the Razer Thresher Ultimate headset is pretty easy to use. Power on the headset by holding the headset power button until you hear the ON tone, the LED indicator lights up, or the Razer logo on the earcup starts blinking. 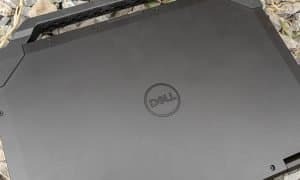 Next, power up the audio hub by pressing the power button. The power indicator will blink until it find and connects to the headsets, which usually only takes a few seconds. 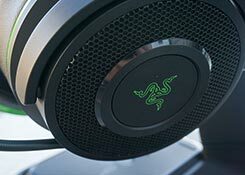 The Razer Thresher Ultimate can be used in regular or Dolby Digital 7.1 Virtual Surround mode. To enable the Dolby Digital mode, press the Dolby Headphone button on the audio hub and it will light up to indicate it is on. To disable it, press the Dolby Headphone button again. To adjust the audio volume, rotate the volume dial on the right earcup towards the back of the earcup to increased the volume or towards the front to turn the volume down. 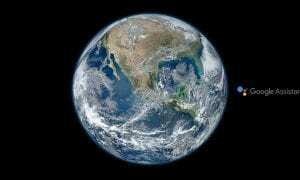 Once you hit either of these limits, you’ll hear a short beep. You can also mute the volume altogether by pressing the volume dial in towards the headset. To use the microphone, simply retract it from the left earcup and position it in front of your mouth for best results. While on the Xbox One, you can use the game/chat dial to adjust the balance between the two. 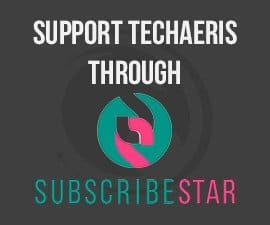 Rotate the dial towards the back the headset to increase the chat volume and rotate it towards the front of the earcup to increase game audio balance. Between the master volume and game/chat balance, it’s pretty easy to get your preferred volume. Like the master volume, you can mute the microphone by pressing in on the game/chat balance dial. While on the PC or Mac, the game/chat balance dial simply controls the microphone volume, but you can still mute it as well by pressing down on the dial. NOTE: while we tested it on the PC, we didn’t on a Mac but the instruction guide has Mac instruction within it. I’ve used a number of different Xbox headsets over the past couple years ranging in sound quality. Needless to say, the Razer Thresher Ultimate with it 50mm audio drivers rank right up there with the best sounding wired gaming headsets that I’ve used. When the Dolby virtual surround is enabled, the sound is definitely full and rich — and rather loud at full volume. Even when maxed out though, audio is crisp and clear without any distortion. Everything from racing games to shooters to fun arcade games sounded fantastic with this headset. The rumbling of car engines as you race through the Australian Outback in Forza Horizon 3 was nicely balanced with the in-game music, while gunfire, explosions, and enemy sound in Doom with the Dolby sound made the game just that much better. Mass Effect: Andromeda even sounded better on the headset than with my current 5.1 surround system, both while in inside and outside environments. I did have issues with Diablo III on the Xbox One, however, and had to disable the Dolby sound for that game. 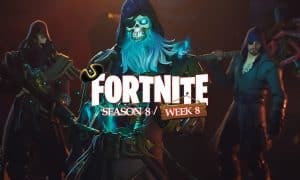 The issue surfaced mostly while playing the new Necromancer class and when corpses exploded there was definitely a noticeable crackling sound heard. The game still sounded pretty decent without the Dolby virtual surround enhancements. As it was the only game out of the dozens I tested that I had issues with, I’m chalking that one up to issues with the game itself. Wireless headphones can at times be laggy, which causes the audio to be slightly behind the video on the screen. 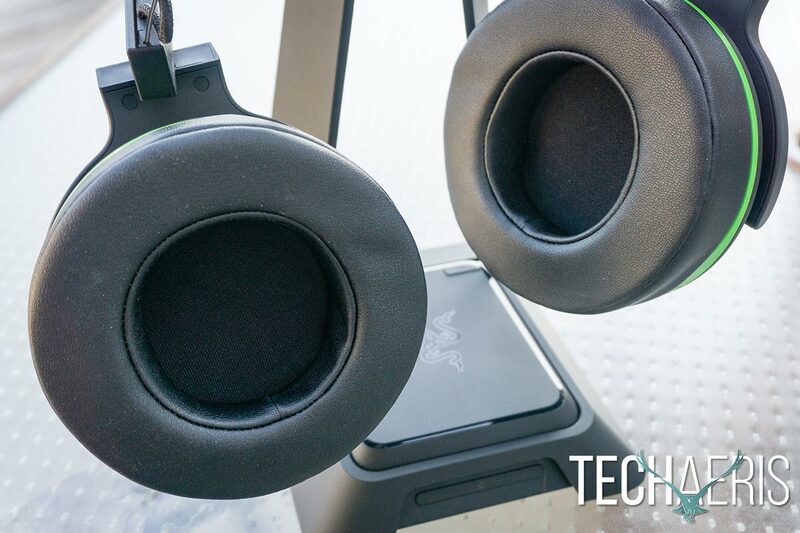 That isn’t the case with the Razer Thresher Ultimate gaming headset and in all the games we tested, as well as a quick video test, the audio was perfectly in sync with the visuals currently displayed on the screen. Speaking of video, the headphones sound just as fantastic when watching a movie (I tested them with a few movie trailers) and even listening to music. When in a party on the Xbox One, the other party members had no problem hearing me clearly. 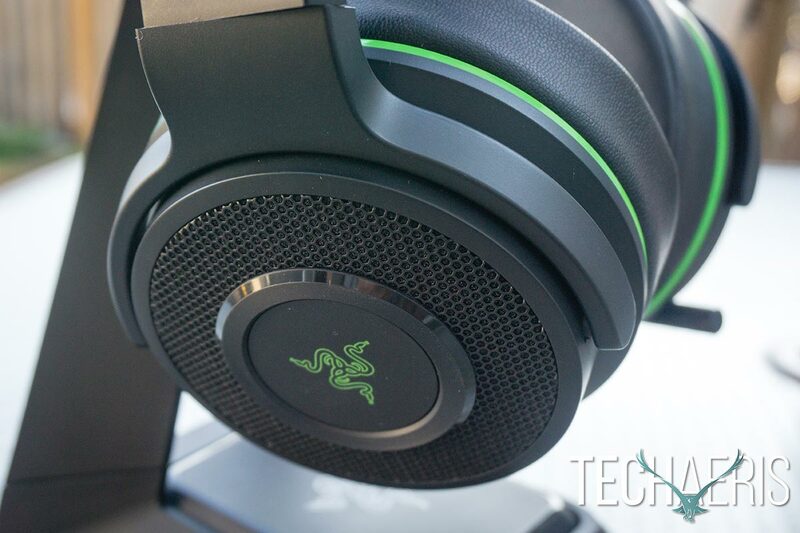 One missing features I wish the Razer Thresher Ultimate headphones had is mic monitoring. 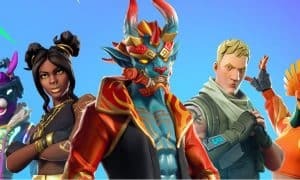 While not the end of the world, it does feel a bit odd talking and not being able to hear yourself while chatting with others in your party. Microphone audio was clear and easy to hear by other party members. Reception is always a concern with wireless headsets and speakers. 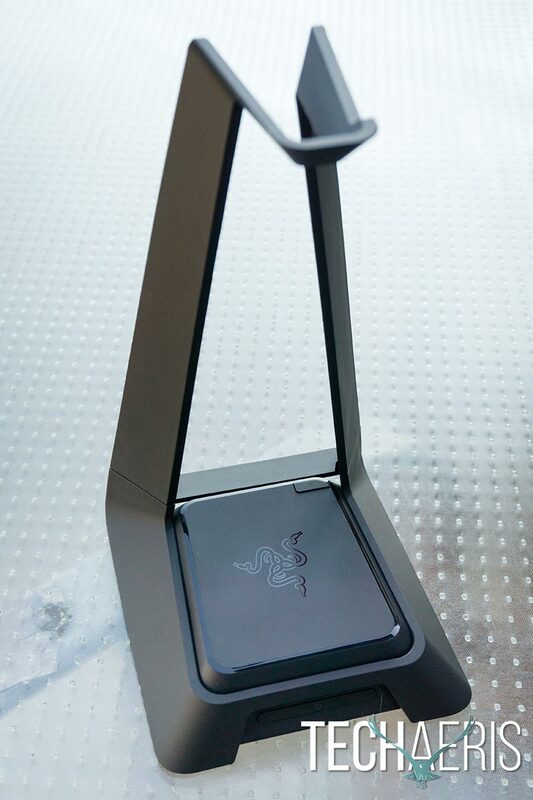 The Razer Thresher Ultimate uses the 2.4GHz frequency to connect between the audio hub and the headset. With a claimed range of 40′ (12m), I had no issues while in my basement using them, even when 25′ away from the audio hub base. Of course, a clear line of sight is recommended but given you’ll be using these while playing on your Xbox, it’s doubtful you’d be in a different room while using these. Due to the dual antennas in the headset, sound reception remained solid even when turning your head from side to side while using them. Before first using the Razer Thresher Ultimate headset, Razer recommends you charge it fully which takes about four hours. To recharge the headset, connect the second USB to Micro-USB cable to the USB-A port on the audio hub and the Micro-USB port on the left earcup of the headset. While charging, the LED light will be red, once fully charged it will turn green. Razer claims that the headset will get 16 hours of battery life on a single charge, and the Thresher Ultimate did not disappoint. During our testing with Dolby Digital enabled we were able to easily hit this market and then some. You’ll know when your battery is running low as the LED light will blink red and you’ll hear a warning tone as well. The battery life on these won’t disappoint and will definitely last through many a marathon gaming session if necessary. While the Razer Thresher Ultimate isn’t currently available — they will be arriving at some point over the summer, they do retail for $249.99USD. Given the build quality, comfort, sound quality, and battery life, this Xbox One/PC/Mac gaming headset is reasonably priced — and there’s definitely added value with these being wireless. For those with a PlayStation 4, Razer also sells a headset for the PlayStation 4 that is also PC and (presumably) Mac compatible. If you’ve been looking for a lag-free wireless gaming headset with great sound and fantastic battery life for your Xbox One console, look no further than the Razer Thresher Ultimate for Xbox One — a headset deserving of a Top Pick of 2017 Award here at Techaeris. In my opinion, it’s the current gaming headset to beat for the Xbox One. 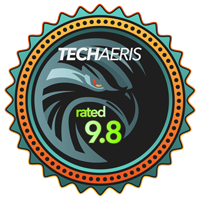 *We were sent a sample of the Razer Thresher Ultimate for Xbox One for the purposes of this review.